The most formidable opponent to imperialism is a democratically free, politically engaged, and educated populace. This is proving especially true in Hong Kong today, where the students and workers are standing their ground by demonstrating for the autonomous democratic rule of Hong Kong, free from the shackles of the People’s Republic of China’s imperialistic designs. The Chinese president, Xi JinPing, is left with quite the monumental headache as to how to handle these uprisings in the midst of the 65th anniversary of the founding of the PRC. In a particularly showing example, the misdirection and heavy handed political actions from Beijing recently prompted the unannounced shutdown of Instagram. To understand the significance of Occupy Central in Hong Kong, we much have a clear understanding of China’s relationship and its explosive capitalism. China exists under a strange veil of immense cognitive dissonance, much like the America. While in America the message from government is patriotism and a love for “democracy”, the government has a clear goal to thwart any truly radical expression against the crony capitalistic regime. China stands under the banner of communism, calling on the spirits of revolutions past while forcing a restrictive state capitalist system. Both are simple marketing ploys meant to manipulate the populace by reliving nostalgia for the old revolutionaries of America and China. America playing on its use of the founding fathers is much similar to Xi JinPing using the figure of revolutionary nationalist, Deng XiaoPing, who heralded the economic reform in China and greatly increased the standing of China on the global market. Interestingly enough, even the Occupy Central protesters have taken up supporting Deng XiaoPing and warping his image to suit their needs, ignoring the fact that it was this statesman who called for the lethal force during the 1989 student protests in Beijing. Much like Mao ZeDong, Deng XiaoPing has become little more than a figurehead for both sides. If you can’t impress them with your own vision, blind them by turning a washed up revolutionary into a saint. While America has become a model of domestic abuse of it’s own civilians through the corrupted arm of the police; an entire social media platform disappearing overnight should be a massive alarm to Chinese civilians. No rhyme or reason, no false excuses about how they want to thwart possible Instagram Uyghur terrorists in light of the coming National Day, nothing. The Chinese Communist Party, in which Xi JinPing has positioned himself as arguably the most powerful statesman since Mao ZeDong, levies heavy restrictions to freedom of speech in order to preserve the status-quo and it’s further economic expansion. It’s hard to imagine the millions of Chinese Instagram users won’t overlook this shutdown without the slightest curiosity. In fact, it draws more attention to the issues in Hong Kong, as millions will soon discover. Each instance of heavy handed Chinese policy serves to only degrade relations between the Chinese citizens and the supposed “Communist” Party. No amount of praise for Deng XiaoPing will remedy that deterioration. Hong Kong’s semi-independence has been turbulent since 1997 when it was relinquished as the final British colony, returning to mainland China. Since it was under imperial control for almost 150 years, Beijing made many promises to ensure a policy of “One China, Two Systems.” This sentiment was originally supported by Deng XiaoPing to express his ability to allow Hong Kong, Macau, and Taiwan to retain their current economic and political systems if they were to return to China. Nearly 20 years after this discussion, it became a reality as Hong Kong was reunited with China. Very quickly the two economies developed a strong relationship, and even stronger economic ties. With China’s expansion comes even greater economic gains for Hong Kong, as China will need more workers in the service industry and Hong Kong has long ago established a service based economy. The ties between these two countries are crucial, so is Hong Kong right in it’s dissent? Accounting for 66% of it’s annual tourism rate at a whopping 17 million people, Chinese have never been so eager to flood into Hong Kong as they are now. The growing middle class market of China has been flooding into Hong Kong over the decade in order to indulge in discounted luxury goods. According to a World Trade Organization report, “Hong Kong, China remains one of the most market-oriented and open economies in the world-” Hong Kong doesn’t share the same high tax rates as China on luxury goods, which makes it an ideal travel destination for Chinese citizens who want to shop. A common issue within China is the production of fake products or extremely high taxes on real products; so as the Chinese economy grows, so does Hong Kong. 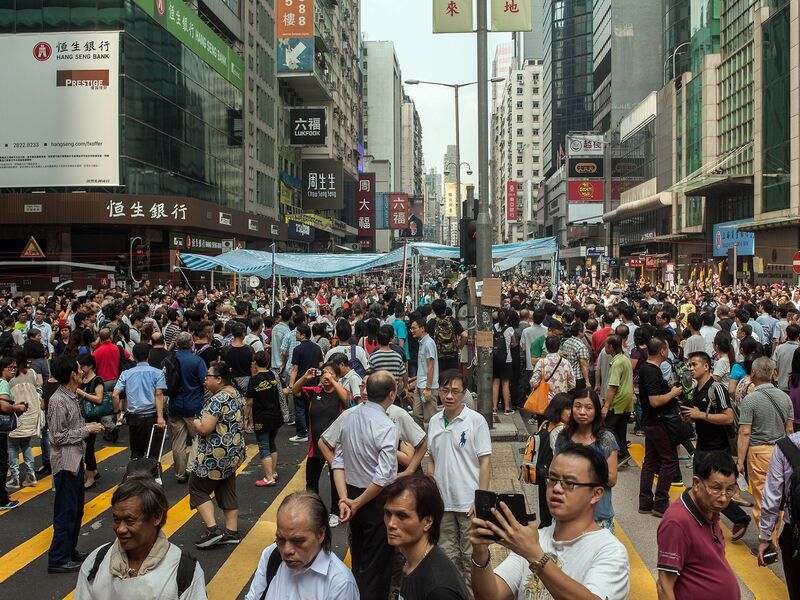 There have recently been cultural clashes between the Hong Kong citizens and the Chinese, the former often referring to Chinese tourists as “locusts” and decrying their supposed lack of proper hygiene. Instances of Chinese mothers allowing their children to use the streets as toilets caused much outlash by the Hong Kong residents who have lived with Western cultural standards for over a hundred years. Not to mention the density of Hong Kong Central and Kowloon, which make these kind of actions dangerous to the health of citizens who have already been ravaged by plagues in the past. President Xi JinPing had no qualms with sticking by the policy of One Country, Two Systems; for the sake of stability and a peaceful integration into China. Also, we can see how protests are nothing new for Hong Kong. Just two years ago as the previous president of China was stepping down from office, Hu JinTao made a visit to Hong Kong. During his visit on the 15th anniversary of the reacquisition of the country to China, the president swore in the new Chief Executive of Hong Kong, Leung Chun-ying. This installation of C.Y. Leung promoted massive pro-democracy protests in the numbers between 100,000-400,000 individuals who demanded true democracy free from Beijing by 2017. In recent Occupy Central protests, President Xi originally offered to allow “democratic” elections so long as Beijing chose the candidates. This blatant act of serving up a false sense of democracy isn’t much different than what is supported by America both domestically and internationally. When America destabilizes a region, there’s a rush to “democracy” in order to play on a new found sense of freedom gained by American funded terror cells killing the previous leadership. This democracy usually means injecting a pro-American schmoozer into power. Even domestically we’re given the option of two political parties in America as the mainstream media builds the perception that only the Democrat and Republican parties are of any worth. When the Green Party of America attempted to show up at the national debates between the political false-dichotomy, they were arrested. This shows just how much the media and government of America actually support the idea of fair democracy. Rather than accept a Yes Man to Beijing, the students quickly took up arms in the “Umbrella Revolution” which has been quickly supported by Occupy Central which originally failed weeks prior to win the hearts of the people. Occupying government headquarters and defending themselves with their umbrella against mace attacks; they show no signs of buckling. With each wave of police repression the people don’t back down, but rather the numbers swell up, causing further tension on the streets. There have been many conflicting reports over the past few days from Hong Kong officials and actual evidence as to how the police are responding. It’s suggested that in some instances, the police are lowering their numbers to allow the protests but we can see a very different picture presented through videos of the police adorning riot armor and shooting into the crowds with tear gas. So while the people of Hong Kong fight for their right to democracy, the American people remain complacent with corporate rule over the election process. Criticisms of the Occupy Wall Street movement in America usually weren’t with the peaceful unrest itself but with the lack of a clear motive. The American media, when they were eventually FORCED to cover it, rushed to spin Occupy to be some unsettled mass rising up for no reason. This couldn’t be further from the truth. There’s a clear reason for Occupy of America and the Occupy Central movements even if the motives remain different. What the American protesters shared with those in the Occupy Central protests is an understanding of widespread internal injustice harming their respective countries. “On the mainland, as long as you can control the streets with enough soldiers and guns, you can kill a protest, because everywhere else is already controlled: the press, the Internet, the schools, every neighborhood and every community,” says Xiao Shu a Chinese writer currently studying in Taiwan. The iron fist of Deng XiaoPing made quick work of the 1989 Tiananmen Square protests and the Chinese internet has become deaf and blind to the massacre. Even the ability to post candles each June 4th on social media sites has become banned as it would be a small way for Chinese netizens to commemorate the event or to remember loved ones whom they lost. In another clear instance of not understanding the resilience of information in the current era, China has only served to draw attention to the events they hope to sweep under the rug as everyone starts to ask why they can’t post candles on June 4th, or why “jasmine” was banned in light of the failed Jasmine Revolution which called for pro-democracy demonstrations within the mainland. Failing to realize this would be the real blow to Xi JinPing if he attempts to counter the peaceful protests in Hong Kong as Deng XiaoPing would have. Any violent action against the Hong Kongers will prompt a quick reaction within the mainland where the citizens will be forced to re-examine their own ability to protest and the daily censorship they live under. This could serve to cause massive demonstrations within the mainland itself. It’s imperative that President Xi looks at alternatives and tries to play on the 53% (mostly the older generation) who support the partnership with China. This older generation has seen the prosperity of working with China and it relies on them to stabilize the situation. In America, there is not usually a need for military action against the populace as the people are kept well and apathetic towards domestic issues. Even instances of the American government killing citizens of the world with drone strikes goes overlooked and isn’t cared for despite the possible ramifications on their own well being. It’s embarrassing to see so many Americans disengaged from political action while Hong Kongers can manage both their daily lives and protesting for democracy. The Ferguson protests, whether you agree with the judgement call by officer Darren Wilson or not, show the force at which the police can and will retaliate in the face of peaceful protesters. 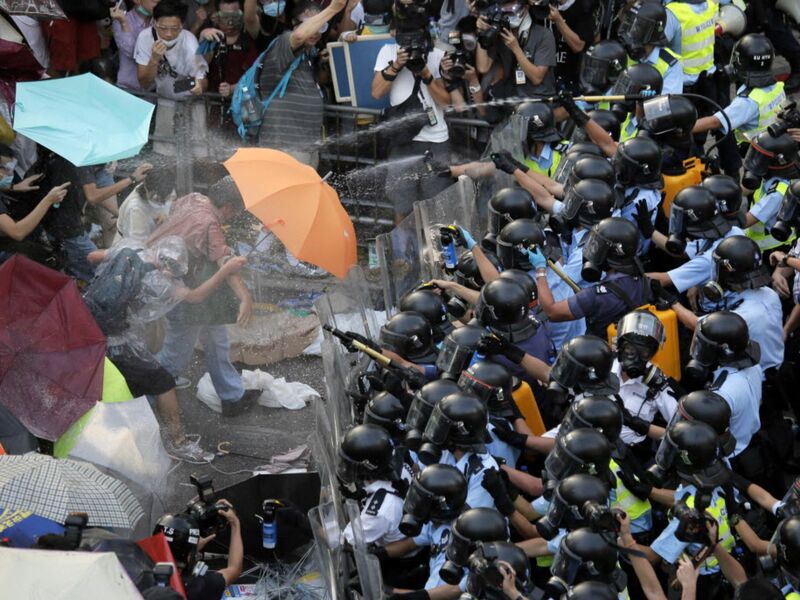 It makes the tear gassing of Hong Kongers during their pro-democracy rallies look like a weekend in Bali. When we witness the violent oppression on a military level in a small town over protests, we should take up arms. Rather, we sit idly by while we allow our rights to be sold off under the guise of increasing domestic safety. While Occupy didn’t have a clear end goal in America, it was a rallying call to all Americans. It was a mutual understanding of many issues which plague our lives and a cry out that we’re frustrated. From here, we need to direct that frustration towards solving our problems, rather than mindlessly lashing out. The current crony capitalistic system in America has a stranglehold over the American way of life and is causing large sections of the population become disillusioned with the American Dream. United, we can solve this issue. Much as how the Hong Kongers are uniting to fight for their ability to hold democratic elections free from Beijing. Why can’t Beijing just settle down and allow Hong Kong its right to assemble a new government? The stability of the capitalistic market in China is the reason why they can’t simply hand over Hong Kong to an uncertain leadership. While Hong Kong does hold a pretty measly GDP, it’s still an essential part of China and the trade between the two countries offers prosperity to both of them as China has emerged as a world superpower through its rapid expansion of domestic industry. Rather than being governed by a free-market like Hong Kong, China owes its great leaps of expansion to the government controlled capitalism. Since taking office, Xi JinPing has taken up the task of fighting corruption within the CCP in order to make himself a strong public figure and to be able to steer China’s economy in a clear direction. While there’s certainly not much arguing against this government controlled capitalism and its effectiveness versus a free market which can quickly turn to sour cronyism like America, there’s a growing need to slacken the reins. Not just on the economy, but in terms of giving the people a voice domestically. An increase of Chinese freedoms could also ease relations with Hong Kong as they wouldn’t feel their personal freedoms were in jeopardy. The easing of Chinese censorship could also allow for a peaceful reform period where in the people can begin to take on more power from the CCP and feel great benefits from the capitalistic boom through an ease into socialism. The lifespan of the CCP must come to an eventual end, and it can either choose to support the people by changing, or wait until civil unrest mounts in Hong Kong/Taiwan/the Mainland. China, much like America, can not ride the wave of capitalism forever and must begin to start instituting more socialism before imperialistic capitalism hits its wall. In America we must see Chinese growth not as an economic threat, but as a message that our era of capitalism has come to an end. When fueled by capitalism the state will go to great lengths at preserving that system, much to the detriment of the people. It’s time for us to piece together this puzzle of systematic American power snatching by cronyistic powers. Not putting our foot down a decade ago was the real mistake and each day we remain idle is another nail in the coffin.